There’s only one place you can order anything, at any time of the day, quick and cheap: diners. Not just any diner, but diners located in New York or New Jersey. California just doesn’t cut it when it comes to diners. Diners should be decorated in the style of the ’50s or ’60s, and the waitress behind the counter should have fresh cigarette smoke on her breath, waiting to take your order from a menu too large to comprehend. In fact, you don’t really need a menu, you can order whatever you want, they probably have it. I order the same thing every time I go to a diner: an open-faced turkey sandwich. It almost always comes witih gravy, mashed potatoes, corn and cranberry sauce. Thanksgiving is just a few weeks away but if you’re anything like me, you can hardly wait. While preparing an entire Thanksgiving meal takes quite a bit of time, this quick and easy method allows you to enjoy Thanksgiving at any time of the year! 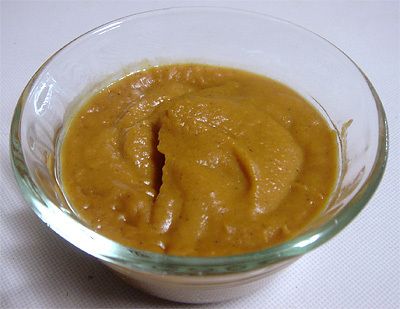 I took an extra shortcut and bought canned organic sweet potato puree, and while faster, it may be difficult to find. * Note: Look for roasted turkey breasts alongside the roasted chickens in your grocery store. Otherwise, bake a fresh turkey breast tenderloin in the oven according to the package instructions. If all else fails, deli-sliced turkey makes a decent substitute. 1. Add the turkey and gravy to a saucepan and place over a medium-high heat. Meanwhile, toast the bread. Cook the corn in any way you see fit, I simply microwave it on a plate with a few drops of water for 45 seconds. 3. Pour gravy on everything, season with salt and pepper and enjoy an early Thanksgiving! Looks delicious! And definitely the best holiday of the year!! hmmm I’ll have to think of what my favourite peanut butter recipe is – it’s hard to choose! Yum! Easy Thanksgiving food! The sweet potatoes are definitely my favorite! This looks so yum! And it makes me want Thanksgiving dinner… right… now! Thanks! i thought i couldn’t possibly be more excited for thanksgiving.. that is, until i saw this post :D looks SO GOOD! ooh, i love thanksgiving, especially the sandwiches that follow :) what, no pb in the sweet potatoes?? and um, pb gnocchi would rock. maybe with mashed banana? and a chocolate sauce… ok now you’ve done it. i just may have to attempt this!! OK, I love your profile name. I’m not even joking when I say that when I saw it, I made myself a Peanut Butter and Jelly sandwich, which I have almost every morning for breakfast. I had already had my most favorite ice cream in the world, the Target brand Fudge and Peanut Butter ice cream. If you haven’t tried it, you must. And, for my cookie exchange I’m doing in December, I’m making these Martha Stewart cookies with PB in the middle! I will definitely be back. You are on my Reader! There’s nothing like East Coast diners. I found that out when I moved to Tucson. Diners are rare there. I’m glad to be back in NY where diners abound. My Mom orders the same turkey sandwich as you, and it’s always real turkey not cold cut type of turkey. Working on the pb recipe for you. Nick, I fully agree!!! Love it! ohh, i love diners! and i love open faced turkey sandwiches even more. they’re my favorite part of thanksgiving! i never thought about preemptively making myself one! great idea. mmmm. Nick, Thanks for stopping by my blog! Yesterday my husband and I helped serve about 200 open faced hot turkey sandwiches at the Holly Fair fundraiser our church holds. Very delicious. I’ll be looking up my favorite peanut butter recipe. Do you need photos or just the recipe? I only make peanut butter balls at Christmas, but its my kids favorite cookie. I love Thanksgiving food. 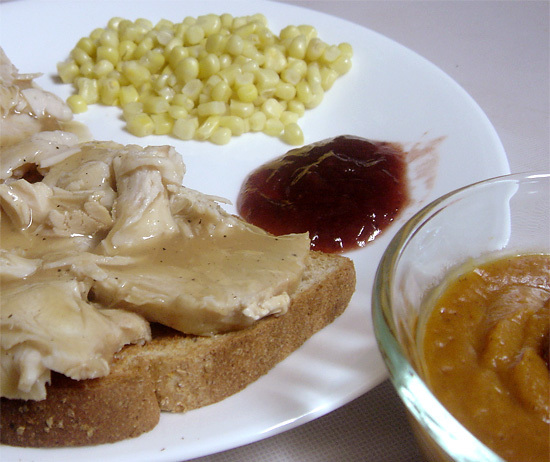 The open faced turkey sandwich with gravy is one of my favorites. Mmm, I adore turkey and cranberry sauce. It’s become the thing that I get whenever I’m at cafes or sandwich places- if its got turkey and cranberry sauce sandwich on the menu then I’m ordering it! I am so with you! Thanksgiving dinner has got to be one of my most favorite meals ever…I don’t know why I don’t make it more often during other times of the year! My hubby and I used to frequent a diner in Woodland and I would often get the open faced roasted turkey sandwich. Your dinner looks just as good! NO idea it was Natl PB month, totally learned something here. What’s odd though is that I’ve recently made TWO pb type thingys…so it was like I was organically channeling the experience anyway. Cosmic. I think I need to be an honourary American for Thanksgiving. I feel like gobble gobble day is a passing memory and now you’ve made it come to life again. Keep ’em coming!… and try the 100 calorie dark chocolate. Awesome and portable! Yah for turkey! And National Peanut Butter month?! I should definitely do some celebrating! Cheers! Looks neat! Have a great one this year!